Covers of Presbyterian periodicals at PHS containing articles about the Vietnam War. Both the United Presbyterian Church in the U.S.A. (UPCUSA) and the Presbyterian Church in the United States (PCUS) reflected upon and studied the conflict vis-à-vis Christian ethics. Both predecessor denominations to the PC(USA) also issued policies, statements, and recommendations that voiced deep concern for the socio-political issues surrounding the war and its aftermath. Information about the Vietnam War is contained in several groups of archival records deposited in our holdings. The UPCUSA Emergency Ministry on Conscience and War Records (RG 410) and the PCUS’s Division of Church and Society Records (RG 503), for example, document each denomination’s efforts to educate its members and help make sense of the practical and theological challenges of the war. 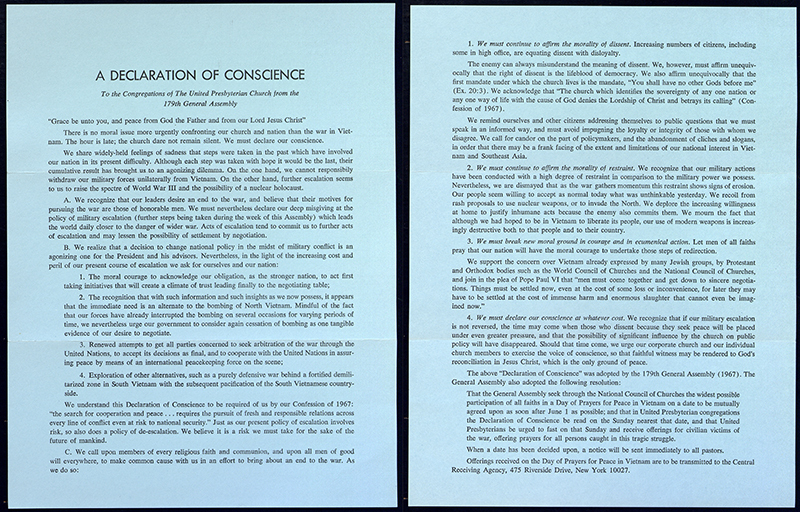 Presbyterian work related to the war is also included in the records of ecumenical organizations held at the Society, such as the National Council of the Churches of Christ in the U.S.A.
A Declaration of Conscience, 1967. Accession number 82 0126, box 6. Click here for full image. 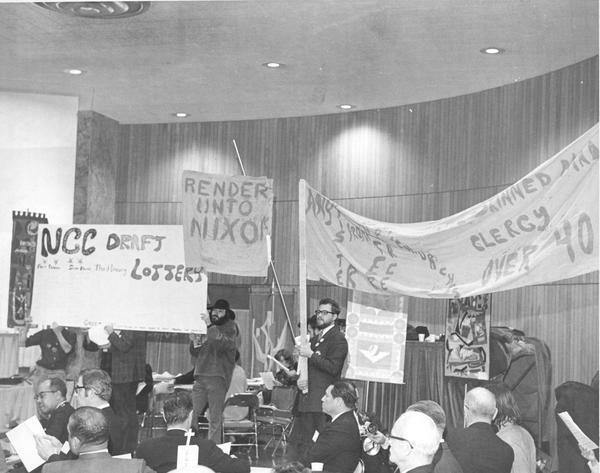 Pearl, our digital archives, includes photographs of anti-war activities and audio recordings, such as a 1968 sermon and question-and-answer session on the war delivered at the Rivermont Presbyterian Church (Lynchburg, Va.) by pastor Calvin Thielman. Our online catalog, CALVIN, describes additional materials helpful for those interested in the Presbyterian response to the Vietnam War. Furthermore, we hold a complete run of the Minutes of the General Assembly of both the UPCUSA and the PCUS that provide details on the positions, actions, and reports of the Churches relating to the conflict. UPCUSA General Assembly Minutes, 1970. These resources provide a beginning point to learn about Presbyterian involvement in this painful chapter of American history. We invite you to explore further using our online catalogs and research tools, and to contact us directly with any specific questions. Special thanks to Bruce Gillette for encouraging us to share resources on this topic. CALVIN, the society's electronic catalog. 13 hours 47 min ago. Today’s #HistoricalFigureFriday honors Reverend James Patriot Wilson. Born in 1769 in Lewes, Delaware Wilson went on to graduate from the University of Pennsylvania in 1788. He initially studied law and was admitted to the Bar but the unexpected death of both his wife and brother led him to a religious path. He was ordained as pastor of the Presbyterian Church in Lewes in 1804 and in 1806 he accepted a call to lead the First Presbyterian Church in Philadelphia. He resigned as a much celebrated pastor in the spring of 1830 before he died December 9th 1830. Our portrait of Reverend Wilson was painted in 1807 by none other than James Peale the younger brother of Charles Willson Peale. This oil on canvas painting represents one of the many large portraits James Peale completed after he shifted away from miniatures. To see more works by James Peale visit PAFA The Pennsylvania Academy of the Fine Arts or the Philadelphia Museum of Art.